Prepare yourself to enter the Death Derby Tournament ‹ the hardly collectible card game of over-the-top vehicular combat where machine guns roar, missiles light up the sky, and a carton of eggs can stop a tank. Choose one of ten stock vehicles or create your own. Then begin your rampage by gathering weapons and upgrading your vehicle while blasting opponents and overcoming battlefield hazards! 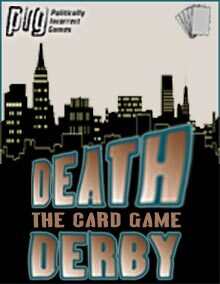 Death Derby was designed with simplicity in mind. The rules are easy to learn and gameplay is fast and fun. Three different sets of playing cards are included. Each needs to be printed, cut, separated, and then compiled into a complete deck. Mark Cookman 7 7 7 I would like to see this in color, but it is a fun little card game with lots of theme. Great filler for post Apocalypse or funny racing games fans. Well worth the price.